This artist's conception of the 4C60.07 system shows two colliding galaxies, one of which (left) has already turned most of its gas into stars and its black hole is ejecting jets of charged particles. This galaxy is pulling gas and dust from the neighboring galaxy (right), where star formation is occurring. Our MilkyWay galaxy contains a supermassive black hole at its core, as do most if notall other large galaxies in the modern universe. These gravity wells can havemasses of millions to billions times that of the sun. Now,astronomers have more support for the idea that suchblack holes are common among the earliest galaxies going back to nearly thebeginning of time. A new study suggests galactic black holes were around even12 billion years ago when the universe was only 1.7 billion years old and galaxies were justbeginning to form, the astronomers said. "Remarkably,both galaxies contain supermassive black holes at their centers, each capableof powering a billion, billion, billion light bulbs," said lead researcherRob Ivison of the United Kingdom Astronomy Technology Center. "Theimplications are wide-reaching: You can't help wondering how many other colossalblack holes may be lurking unseen in the distant universe." Astronomershad first noticed one of the galaxies, called 4C60.07, due to its bright radioemission, which is a telltale sign of a quasar, or a rapidly spinning blackhole that is feeding on its home galaxy. And until now, they thought hydrogengas surrounding the central black hole was undergoing a burst of starformation, churning out stellar babies at a rate of about 5,000 suns everyyear. Morerecently, they used the Submillimeter Array of eight radio antennas located in Hawaii, finding 4C60.07 was not forming stars after all. In fact, its stars appeared to berelatively old and quiescent. Instead, aburst of star formation is taking place in the previously unseen companiongalaxy, which is rich in gas and deeply enshrouded in dust. The new radioemission data also showed a stream of gas being pulled from this newlydiscovered galaxy by its neighbor, 4C60.07. "Thesetwo galaxies are fraternal twins," said researcher Steve Willner of the Harvard-Smithsonian Center for Astrophysics in Massachusetts. "Both are about the size ofthe Milky Way, but each one is unique." Theresearch also involved looking at data on the galaxies collected by the SpitzerSpace Telescope.? 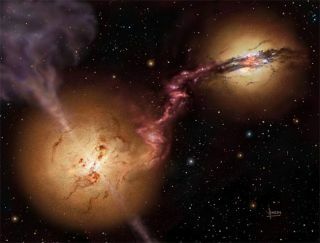 "Theexpectation is that the galaxies would merge and then the black holes wouldmerge," Willner told SPACE.com. "And I don't want to beanywhere nearby when that happens. It'll be very spectacular." He added,"By now, if we could see them now probably we would have a very big, butold galaxy with one giant black hole in the center that's the merger of thetwo."